4202580 Blue Brick Key Chain is a Key Chain. Its year of release is unknown. 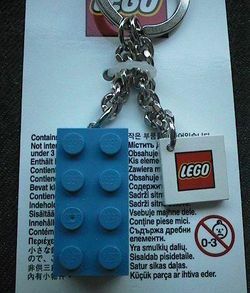 It features a bright blue 2x4 brick, as well as the LEGO logo printed on a white 2x2 tile, attached to a key chain. Facts about "4202580 Blue Brick Key Chain"
This page was last edited on 9 January 2016, at 15:19.